Scotland is to be involved in a programme of monitoring underwater noise in the North Sea. Other European countries along the sea are also to take part in the project which is due to begin on 1 January. A network of devices deployed off Scotland's east coast by Marine Scotland will be used. The aim of the EU-funded project, Jomopans, is to better understand the effects of ambient noise on marine environments. Since 2013, Marine Scotland has been deploying equipment to gather data on marine mammal activity and underwater noise at 30 locations from the Caithness coast to St Abbs in Berwickshire. Among the kit moored at the sites are acoustic recording devices, which begin recording when the echolocation clicks of dolphins and porpoises are detected. Other equipment measures underwater noise levels and can also detect dolphin whistles, which can be used to identify dolphin species. Earlier this year, Marine Scotland and the University of St Andrews used the data to show where different species of dolphins were. 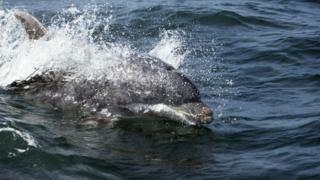 Bottlenose dolphins were detected regularly in the Inner Moray Firth, while a "more diverse mix" of bottlenose, common, white-beaked and Risso's dolphins were detected in other areas of the eastern Scottish coast.